I am taking a trip (entirely within California) with two separate tickets. The first leg is on a major airline, and the second is on a local puddle-jumper. I have 1-1/2 hours at LAX to make my connection, and don't plan to check bags. When I arrive at LAX will I need to leave the secure area and re-enter? Is there a way for the first airline to "connect" the fights so that if there is a delay in the first flight, the second airline will be notified (so that for instance if my layover is cut to 30 minutes they might consider holding the flight til I get from one terminal to the next to board)? By way of explanation: purchasing each flight separately saved me $200, the first flight has a very good on-time performance, and if worst comes to worst and I flat-out miss the second flight, it will only cost me about $100 to either book the next flight or rent a car and drive home. But I like to be prepared just in case. If you are not checking bags, whether or not you will need to re-clear TSA security on a domestic connection at a US airport depends solely on the configuration of the airport itself. In the case of LAX, you will not need to exit the secure area, as there is an underground tunnel that connects T5 and T6, as summarized on the Inter-Terminal Connections page at the official website. A long time ago, the tunnels were the primary way to get to the gates, but that's a matter for history. In T5, the escalators and stairs to the tunnel are located between gates 53B and 55A, near the food court and restrooms. Go down to the tunnel level and follow the signs for T6. It's not a pleasant walk, but it should only take maybe 5–8 minutes or so. In Terminal 6, the stairs/escalator bring you up between gates 64A/65A and 64B/65B. Terminal 1 is not connected airside to anything; T1 is exclusively Southwest. Terminals 2, 3, and B (Tom Bradley International Terminal) are connected via airside shuttle bus; these are mostly Delta and its partners. 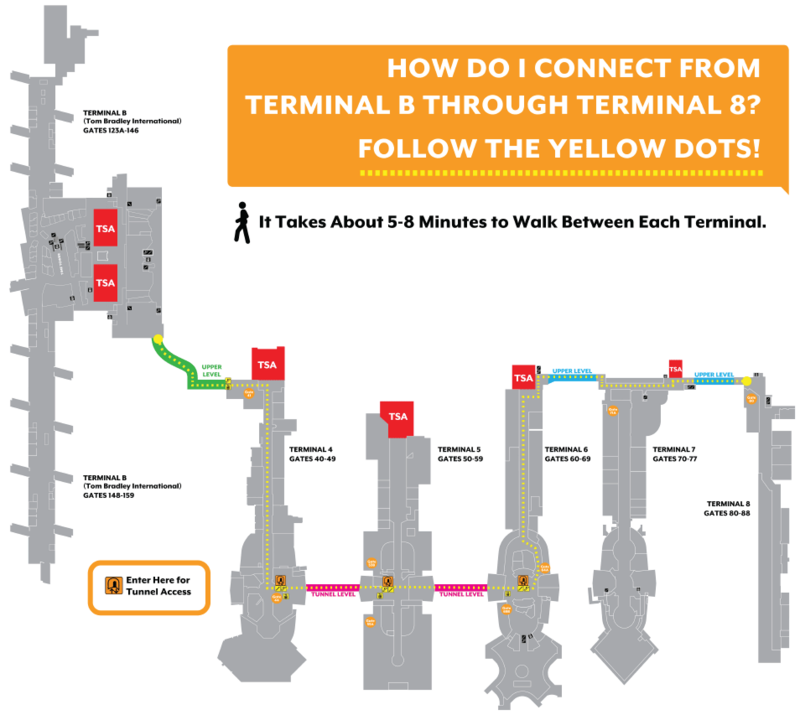 Terminals 6, 7, and 8 are connected an airside walkway just past security near the entrance (north) side of the concourses; 7 and 8 are mostly United and its partners. As to your second question, if you book separate tickets, you incur all risks involved with the connection. If your first flight is delayed or canceled, you have no rights with the second airline, and will only be able to plead for mercy as a customer service gesture; quite often, you will only be able to get rebooked on a space available basis (i.e. standby) and have to hope that there is space on a later flight that day. Not the answer you're looking for? Browse other questions tagged short-connections connecting-flights lax or ask your own question. Change flights in Copenhagen in 1 hour with checked baggage? Is 2 hours enough time to make a connection at Ataturk airport?